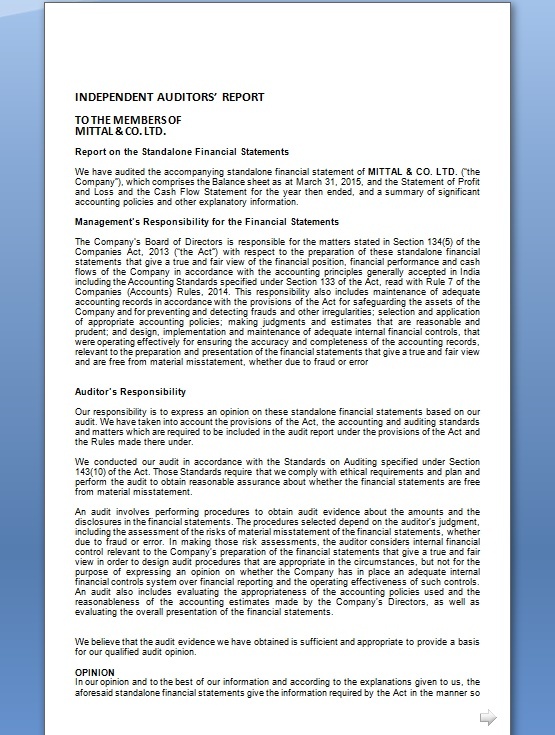 We have audited the accompanying standalone financial statement of MITTAL & CO. LTD. (“the Company”), which comprises the Balance sheet as at March 31, 2018, and the Statement of Profit and Loss and the Cash Flow Statement for the year then ended, and a summary of significant accounting policies and other explanatory information. Our responsibility is to express an opinion on these standalone financial statements based on our audit. We have taken into account the provisions of the Act, the accounting and auditing standards and matters which are required to be included in the audit report under the provisions of the Act and the Rules made there under. An audit involves performing procedures to obtain audit evidence about the amounts and the disclosures in the financial statements. The procedures selected depend on the auditor's judgment, including the assessment of the risks of material misstatement of the financial statements, whether due to fraud or error. 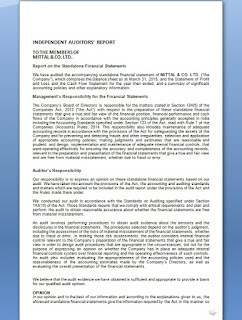 In making those risk assessments, the auditor considers internal financial control relevant to the Company's preparation of the financial statements that give a true and fair view in order to design audit procedures that are appropriate in the circumstances, but not for the purpose of expressing an opinion on whether the Company has in place an adequate internal financial controls system over financial reporting and the operating effectiveness of such controls. An audit also includes evaluating the appropriateness of the accounting policies used and the reasonableness of the accounting estimates made by the Company's Directors, as well as evaluating the overall presentation of the financial statements. We believe that the audit evidence we have obtained is sufficient and appropriate to provide a basis for our qualified audit opinion. required and give a true and fair view in conformity with the accounting principles generally accepted in India, of the state of affairs of the Company as at March 31, 2018, and its profit and its cash flows for the year ended on that date. b) In our opinion, proper books of account as required by law have been kept by the Company so far as it appears from our examination of those books. c) The Balance Sheet, the Profit and Loss Statement, and the Cash Flow Statement dealt with by this Report are in agreement with the books of account. e) On the basis of the written representations received from the directors as on March 31, 2018, taken on record by the Board of Directors, none of the directors is disqualified as on March 31, 2018, from being appointed as a director in terms of Section 164 (2) of the Act. (i) The Company has disclosed the impact of pending litigations on its financial position in its financial statements as referred to in Note 33.2 (d), (e) and Note 34 to the financial statements. (ii) The Company has made provision, as required under the applicable law or accounting standards, for material foreseeable losses, if any, and as required on long-term contracts including derivative contracts. (iii) There has been no delay in transferring amounts, required to be transferred, to the Investor Education and Protection Fund by the Company except a sum of 17 crore, which are held in abeyance due to pending legal cases.